Speaking of which, to everyone who drew/painted a bird August 8th for the August version of Draw A Bird Day, I will be doing a recap post soon with a link to everyone’s artwork. Penny (our 16 year-old kitty) has been ill, and so it’s been a bit delayed, but I’m hoping this weekend I’ll be able to get that posted. I hope you enjoyed my little painting, and are waiting with joyful expectation for the end of the week, as am I. Peace and happy creative moments to all! Never tired of roses…and this is a good one. Thanks, Kerfe. Yeah, I’ll just keep practicing til I’m happy. As long as that bush is in bloom, I’ll always have a ready subject. Thanks for the well-wishes, too. Vet appt. is set for Monday. It is beautiful. I struggle with leaves. Must one day focus on them. Thinking of you and Penny. Thanks, Jodi! I used to also, you’ll get them. Mine aren’t perfect by any means, but I find quick is best. Same with the flowers, I just try and get the essence down. Vet appt. is Monday; we’ll know more then. I’m scared of roses – hats off to you! (hope your cat feels better soon). Thanks, Rebecca. We’ll know more after the vet appt. on Monday. She’s no spring chicken, so we can’t expect too much. I’m usually so tired by the time I get downstairs at the end of the day, I’m not in the mood to pull things together to draw. As long as the bush is in bloom, I’ll always have a ready subject. And roses are something I feel quite sure I’ll never perfect. So, might as well keep trying. 🙂 They usually make for a pretty page in the journal, with the color added. Kitty hugs to Penny and you. I hope Penny improves quickly. Lovely rose today. Beautiful Laura, I like the loose style with lovely definition of the rose petals. 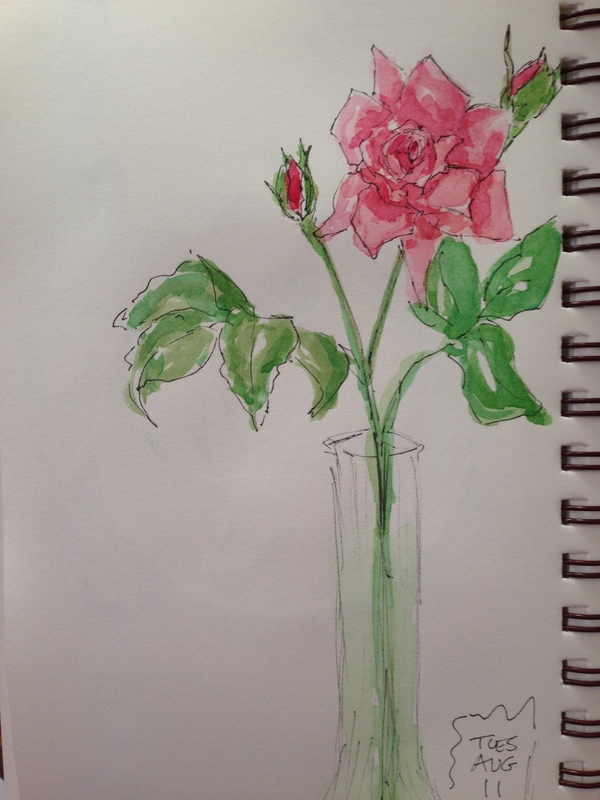 Nice that you kept the vase quiet and allow the rose to be the star. I will never be tired of anything you paint! 🙂 Hope your kitty will feel better soon! Lance, you just made my day with that comment! My florals were horrible at the beginning of spring, and I promised myself I’d improve by the end of summer. Thank you so much! This is lovely…are the outlines in pen? Yes! Pitt Artist pens in black – the superfine tip. Glad you enjoyed! Thanks, Ann! We see the vet Monday at 12:30…..so we’ll know more then. She is 16, so you have to expect that something will be off kilter, I guess. They become a part of the family, though, these animals. They live with you every day. It’s hard to think of her drifting off, even though we’ve kinda been preparing ourselves as she ages. We had a younger cat who died last May and we had no idea he was even ill – had a tumor around his heart. It’s hard to lose them! She’s the only one we have left, and our daughter graduated college and moved last May too. Thanks for asking about her. I hope you have a great weekend in your new place!